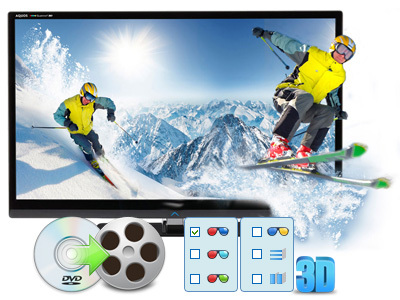 Convert any movie/video to any format with 3D/2D effects. Enjoy any videos on smartphone, tablet and HDTV. Transcode 4K/2K/HD video to FCP X, iMovie, FCE, Premiere, vegae. This best Video Converter Ultimate integrates a best Blu-ray Ripper, DVD ripper, video converter and 2D to 3D converter all together to help you 1:1 back up DVD/Blu-ray movies from disc to PC hard drive for future needs like playing freely; moreover, this all-in-one application allows you to rip/convert Blu-ray/DVD Disc, MKV, AVI, MTS, MXF, MOV, WMV, M4V, FLV and camcorder videos to multiple video formats for iOS/Android/Windows Tablets & Phones, Smart TV/HDTV and HD Media Players as well as video editing software including Final Cut Pro, iMovie, Adobe Premiere, Sony Vegas, Avid Media Composer, and more, so you can enjoy or edit your favorite Blu-ray/DVD movies and any SD/HD videos at will. Video Converter Ultimate is a blazing-fast drag-and-drop digital video converter. The Top Video Converter Ultimate takes full advantage of NVIDIA’s CUDA technology and ATI Stream (AMD APP) technology to help users accelerate conversion speed. 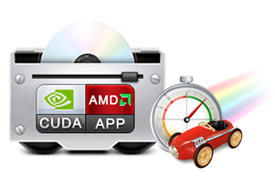 If your computer is equipped with NVIDIA graphics card or an AMD graphics card with AMD APP technology, the GPU acceleration feature in this software application saves users lots of time when choosing H.264 codec for output video format. 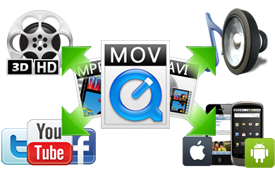 This best Video Converter Ultimate supports multiple file types as source media, including Blu-ray and DVD movies, and a wide range of HD and SD video files, like MTS, M2TS, TOD, MOD, MOV, WMV, MP4, TiVo, FLV, some MXF files, etc that are downloaded online and recorded by camcorders. Plus, the DVD movies can be imported from not only DVD Disc, but also DVD Folder and DVD ISO image. With it, you can convert Blu-ray/DVD movies to MP4/AVI/MKV/WMV/M4V/FLV and many other video and audio formats with high quality. Let you watch, edit, share Blu-ray and DVD movies freely. Top Video Converter Ultimate allows you to customize output file, like freely selecting one desired subtitle and audio track, choose output format among Format list, and adjust profile presets including Video/Audio codec, Resolution, Frame Rate and Bit Rate. This software adopts advanced audio and video in sync technology, which guarantees you a perfect playback performance on any mobile devices or HD media player. Also you can crop video frame and adjust video aspect ratio. 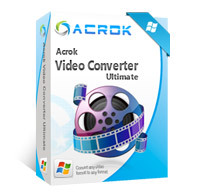 With built-in 2D to 3D converter, Acrok Video Converter Ultimate easily helps people convert 2D Blu-ray/DVD/any video to 3D movies in 3D MKV, 3D MP4, 3D AVI, 3D WMV, etc. for various 3D TV and players. This media converter suite provides different 3D effects for 3D movie creating, including: Red/Cyan, Red/Green, Red/Blue, Blue/Yellow, Interleaved, and Side by Side. Video MTS/M2TS/TS/TP/TRP(AVCHD, H.264, VC-1, MPEG-2 HD), TIVO, AVI, MP4, MPG, MPEG, NUT, H.264, NSV, VOB, MOV, FLV, MKV, MOD, TOD, DV, WMV, ASF, 3GP, 3G2, DRM MP4, RM, RMVB etc. Apple iPhone X, iPhone 8, iPhone 7, iPod touch, iPod nano, iPod classic, iPhone 5S/C, iPhone 4S, iPad, iPad 5, Apple TV etc. Samsung Galaxy S9, S9 Plus, Galaxy Note 8, Galaxy S8/S8 Edge, Galaxy Tab A, Galaxy Tab Pro, Galaxy Tab S, etc. HTC HTC Ull, One Mini, 8XT, Droid DNA by HTC, HTC Bolt, Htc Desire Pro 10, etc. Nokia Lumia 1050, Lumia 1020, Lumia Phone, E63, 5230, E72, N97, N95, N73, N8, N70, 6300, C6 etc. LG LG G7, G6, G5, LG V20, LG V30, G Pad, Optimus F6/F7/F3, Rumor Reflex S, Optimus G, Optimus G Pro etc. Sony Xperia XZ1, XZ2, Z1, Xperia ZL, Xperia ZR, Xperia L, Tablet Z etc. Other Smart phone, Feature phone, Tablets, Kindle Fire HD, Windows Movie Maker, NOOK HD, Google Nexus etc. DVD DVD disc, ISO files, DVD folder, IFO files. Video TIVO, AVI, MP4, MPG, MPEG, NUT, H.264, NSV, VOB, MOV, FLV, MKV, MTS/M2TS/TS/TP/TRP(AVCHD, H.264, VC-1, MPEG-2 HD), MOD, TOD, DV, WMV, ASF, 3GP, 3G2, DRM MP4, RM, RMVB etc.